Is a disability preventing you from working? We can help you navigate the process of obtaining SSDI benefits. The legal aspects of personal injury claims can be challenging. Let us handle your case to help you get the result you're hoping for. Since YCL was started in 1961, our attorneys have been helping injured workers receive the benefits to which they are entitled. Let us help you too. Yablonski, Costello & Leckie, P.C. 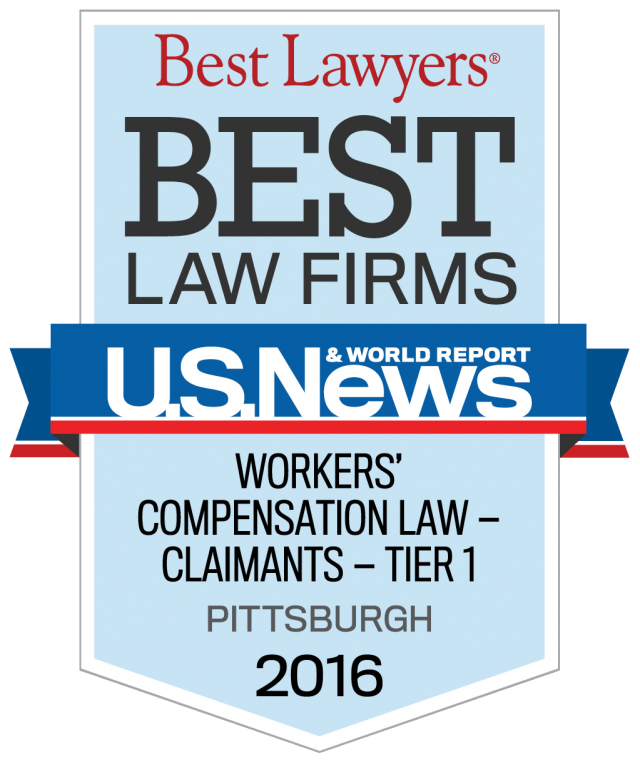 has been named a tier 1 firm in Pittsburgh for Workers’ Compensation Law-Claimants by US News – Best Lawyers® “Best Law Firms” every year since the 2011-2012 inaugural edition of U.S. News Best Lawyers publication ranking law firms. These rankings are based on a rigorous evaluation process that includes the collection of client and lawyer evaluations as well as peer review from leading attorneys in their field. We believe this is a reflection of our experience and expertise as well as dedication to our clients. If an auto accident or an accident at work has caused you to suffer a serious injury, obtaining fair compensation for your injuries is likely one of your top priorities. Your first step to achieving this is to hire a reputable law firm. Yablonski, Costello & Leckie PC has provided injury victims throughout Western Pennsylvania with knowledgeable and skilled legal aid since 1961. With 170 years of combined experience, our lawyers can give you trustworthy legal advice to help you understand your rights and options. Yablonski, Costello & Leckie A Professional Corporation was founded by Kenneth J. Yablonski in 1961 as a Workers Compensation and Personal Injury Law Firm serving clients throughout Western Pennsylvania. We are a law firm dedicated to the needs and rights of our clients. We do not represent large corporations, insurance companies or banks. The legal aspects of workers compensation and personal injury can be challenging. You need an experienced and effective injury law firm to prevail. Our firm has a strong focus on workers compensation throughout Western Pennsylvania. Successfully pursuing a claim for workers compensation requires experience and knowledge of complex laws and regulations and may involve multiple legal proceedings. Our workers compensation attorneys have more than 140 years of combined experience, and bring that experience to the courtroom to help get you the compensation you deserve. In Pennsylvania, you may represent yourself in worker compensation proceedings, but a non-attorney cannot represent you. You should be aware that workers compensation litigation is complex, and your employer or its insurance carrier will be represented by an experienced attorney. If you hire an attorney, you should discuss fee and cost arrangements. The fee agreement must be approved by a workers compensation judge or by the Workers Compensation Appeal Board. Our workers comp attorneys throughout Western Pennsylvania are proud to represent clients who sustain injuries working in a wide variety of professions and industries. Our current and former clients include police officers, truck drivers, teachers, oil and gas industry workers, and construction workers. In most personal injury and workers compensation cases we work on a contingency fee basis, meaning we are paid a percentage of the benefits we obtain for you. When an injury or illness disrupts your life, our firm is here to help you. To speak to an experienced team of workers compensation lawyers, contact Yablonski, Costello & Leckie A Professional Corporation online today to schedule a free consultation. Our firm has a strong focus on workers compensation throughout Western Pennsylvania. Successfully pursuing a claim for workers compensation requires experience and knowledge of complex laws and regulations and may involve multiple legal proceedings. Our workers compensation attorneys have more than 170 years of combined experience, and bring that experience to the courtroom to help get you the compensation you deserve. In Pennsylvania, you may represent yourself in worker compensation proceedings, but a non-attorney cannot represent you.